at customs are eyeing you like you have something hidden where the sun don’t shine. Thank god you can wake up. When traveling abroad there’s a lot more to consider than the joys of disco dancing, table tennis, and men in tight pants. Bad dreams could become reality if you don’t follow some essential guidelines. From passports to vaccines, here’s the lowdown on what’s needed and how to get it so you can avoid a semester in a Tijuana jail cell. To get a passport for the first time, you need to head to a passport acceptance facility. Luckily there are 8,000 in the United States. Just remember to bring: two photographs of our beautiful, smiling, innocent faces, proof of U.S. citizenship and a valid form of photo ID, such as a driver’s license. If we need to renew, you can throw it in a mailbox as long as A) the passport isn’t damaged, lost, or stolen; B) it was issued in the past 15 years; and C) you were at least 16 when it was issued. Just remember to do it far in advance of your travel date because it takes up to 10-12 weeks to process. If you can’t wait four months, then consider an expediting service like PassportsandVisas.com. Costs range from $59 for 8-20 business days to $169 for 24-hour service. Another option is Travisa.com, which has offices in DC, NY, San Fran, Chicago, LA, Miami, and London. Costs range from $99 for 3-10 business days to $179 for 24-hour service. 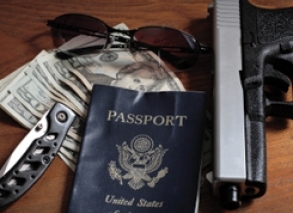 A travel visa grants an individual (i.e., you) permission for entry into a country. Depending on the country and the length of the visit, both a passport and a visa may be required. Each country’s requirements vary. To obtain a visa, you must approach the appropriate foreign consular representative with sufficient time (usually at least 6 weeks) for it to be processed. You’ll likely need an application form, photos, and some cash. If you plan on staying a while and maybe getting a job to supplement all that freewheeling fun, you’ll also need a work permit to go along with that visa. Depending on how far you live from a consulate, how much time you have before you leave, and how much you like waiting in endlessly long lines, you may just want to pay someone else to get that visa for you. The same companies that do passports do visas. Both charge around $50 for three-day service and $100 for rush, depending on the country. Passports and Visas has a great page that lists every country, the consular fees (which you’ll have to pay whether you expedite or not), and the service fee broken down by visa type. We’ve all heard the horror stories: weird rashes, malaria, little fishes swimming up pee streams into nether regions. Sometimes the tradeoff for an exotic vacation is an exotic vaccine. Luckily, the Centers for Disease Control breaks down vaccines into "routine," "recommended," and "required" depending on the country you plan to visit. Click each country here to see requirements. Yellow fever is the only vaccine required by International Health Regulations for travel to certain countries in sub-Saharan Africa and tropical South America. But, Saudi Arabia requires that doozy of a vaccine, Meningococcal, for the annual religious pilgrimages to the Hajj. Once you determine that you need vaccination, you should set up a visit to your doctor or a travel clinic 4-6 weeks before your trip so that the vaccine has time to take effect. Most insurance companies won’t cover travel vaccines—which can be quite costly—and travel clinics are often cheaper because the visit usually costs less. To find a travel clinic, use this locator. For more information, visit the American Society of Tropical Medicine and Hygiene. Vacations are all fun and games until you break a leg surfing in Australia or dislocate a shoulder climbing a statue in Barcelona. When you don't know what the local customs are, let alone the word for "hospital," getting hurt is even less fun than it is back home. And there is only so much a first aid kit and the Doogie Howser of the tour group can do. Before going abroad, you should find out what services our insurance covers overseas. In serious emergencies, the American consulate abroad can be contacted to assist in locating the appropriate medical services, inform family, and help transfer funds from home. Payment will still fall on your shoulders once you’re back on our feet. If your health insurance covers overseas adventures (misadventures most likely), you should carry your insurance card with you at all times. Furthermore, make sure you've filled out the information page on the inside of your passport so people will know who to contact if you pass out while running with the bulls. If you have any preexisting medical problems, you should carry a letter from our doctor that describes the medical condition and any prescription medications (along with more than you'll need for the trip and the generic names so they’re easy to find in a foreign country). Finally, if you want to be on the extra safe side, companies like Medex offer supplementary insurance coverage abroad. The Center for Disease Control provides these tips for staying healthy abroad. Big trips are very expensive and very dependent on time. If for some reason you have to cancel all or even just part of our journey due to illness or another emergency circumstance either at home or abroad, you don’t want to end up with a fat credit card bill and no memories to show for it. Companies like Global Travel Shield, AIG Travel Guard, and Travelex offer everything from simple trip cancellation services to the whole shebang, including trip additional medical insurance, evacuation services, lost baggage insurance, and more. Prices are dependent on destination, age, cost of the trip, and how much coverage you want. But trip cancellation alone will run you from $70 to $240, medical alone $20 to $30, and everything (cancellation, medical, and more) $115 to 220. We can always do what mom taught you and stash your cash in 15 different places all over our bodies. Or you can figure out how to consolidate your finances in a more practical manner. You can buy travelers checks at any of these locations and then exchange them for local currency at banks, currency exchanges, and American Express Travel Service locations once you arrive. The plus is that they can be replaced if stolen. However, since most countries these days are reasonably ATM friendly, there really isn’t much of a need. Use this Visa ATM finder to check out where to find cash near your travel destination. Unless you’re heading for a locale without any ATMs, don’t exchange more than you need for the cab fare from the airport to your hotel. Money Exchanges offer hideous exchange rates. Credit card charges abroad generally carry a 3% conversion charge, so if the exchange rate is unfavorable be wary about reaching for the plastic. However, if the ATM fees are just as bad, then you might consider it for big purchases. In an emergency, you can have your folks transfer money to you through such nifty services as Moneygram or Western Union. The postal service will also send money orders, but they take longer than bank transfers or wire services. Just be aware of the underlying fees. Traveling abroad is not rocket science.